With marching bands and costumed bicyclists and a 30-foot papier mache figure representing Mother Earth, the People’s Climate March felt as exuberant as a parade at times. 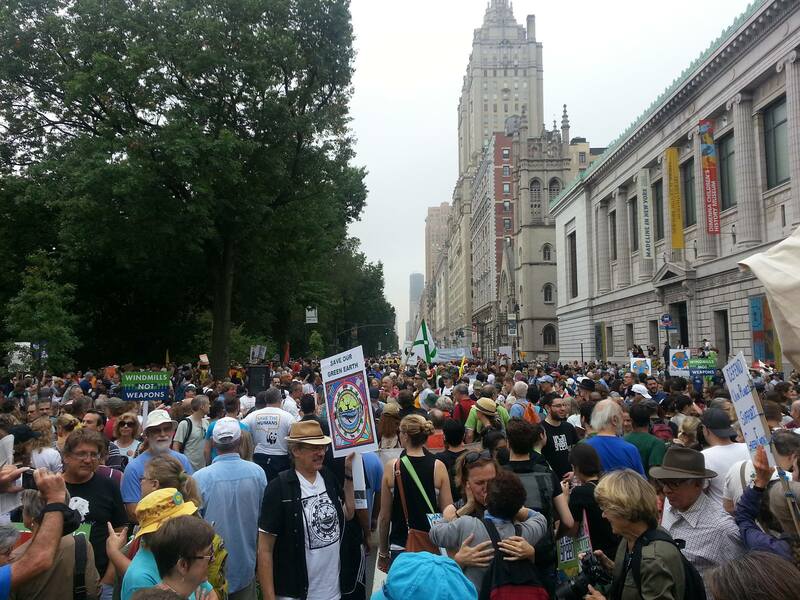 Yet the 400,000 of us who gathered in New York City on September 21 were on a very serious mission: tell the world leaders gathering for the UN Summit on Climate Change that we demand climate action NOW. Some of us came from Portland, Oregon; some came from much farther away. Some were New Yorkers who had first hand experience with hurricane damage and contamination from industry in their neighborhoods. On the block where I stood, there were college students and grandparents, Spanish speakers and English speakers, vegans, people from indigenous groups, and union members. Some were clearly veteran environmental activists or student protesters, but I got the impression from bits of conversation I heard and other non-scientific means how many “ordinary” people were on the street. There were a lot of families with toddlers and elementary school kids, all patiently standing or entertaining themselves for two hours as we waited for the front of the march to move–that’s how packed Central Park Ave West was. On our block the Hungry Marching Band from Brooklyn played funk and New Orleans-style jazz and the whole thing had a very Mardi Gras feel. I loved the music and the spectacle, such a welcome relief and festive alternative to the acoustic 60s protest songs that usually get trotted out at these things. But I also felt torn: this wasn’t a street fair. I wasn’t here to buy kettle corn and browse some handbags made from candy wrappers and find out what the neighborhood association was up to. This was a massive protest against inexcusable lack of leadership from the world’s most powerful people to slow a global crisis. Why did this feel more fun than historic? At 12:58, just as planned (word got to us in the back only by text and email) a hush fell over the entire crowd as we observed a minute of silence for the dead and displaced. The only sound was the thudding of the police helicopter overhead. All of a sudden, I teared up. After recalling pictures of the Philippines, I thought of the kids who are near and dear to me, my sister’s children, the ten-year-old to whom I am a Big Sister through Big Brothers Big Sisters, and most of all my adoptive sobrinos and godson in the Ecuadorian Amazon, who will be the most screwed of any of the young people in my life if we don’t seize the moment to steer the ship away from catastrophe. At 1:00, the entire march erupted in screams, shouts, and music. It was the global call to action, and it was the moment the march became real to me. World leaders might attempt to cover their ears to the call, but the power of all of these people–including so many that represent the “mainstream”–has been indisputably summoned. It was the people’s barbaric yawp. When we finally got moving and the crowds thinned and swelled as we passed through wider and narrower corridors along the route, I realized that playfulness–creativity, enthusiasm, inspiration–is as much the source of this power as desperation and fear of immense suffering and loss. Is this the way through this crisis? Neither the 100 percent doom and gloom of scientific predictions nor the simplistic, Pollyanna, we’ll-all-just-put-solar-panels-on-our-roofs response, but urgent creativity? Fierce play? This question has me rethinking my attitude toward fear, which I’ve always seen as a major hurdle to overcome on the path to living an authentic, fulfilling life. Terror without hope is ruthless and debilitating, but maybe hope without terror is bland and impotent. Maybe terror is the fuel that hope needs to bring about transformation. Terror gives you skin in the game: if you are really terrified, you’d better really believe that change is possible and give it everything you’ve got. So if there is a yin-yang relationship between hope and terror, is it the fusion of the two that generates creative power? Is play the offspring? We have yet to see how world leaders respond to the march in New York and the thousands of solidarity events around the globe on Sunday. Maybe what matters just as much is a new recognition that we’ve got a formidable strategy for saving the planet: Channel that fear, activate that hope, and create as if our lives depend on it. Thanks for your overview. 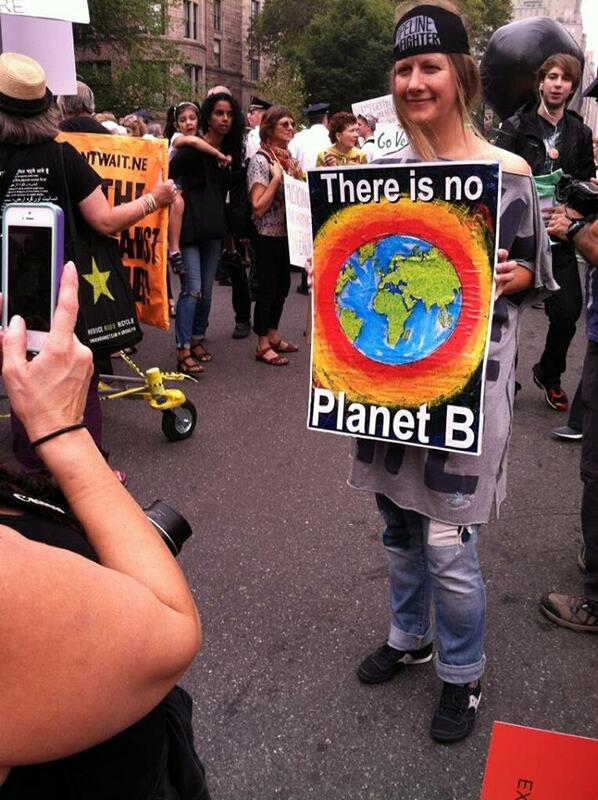 I love that sign “There is no Planet B.” I appreciate your perspective about the mardi gras type atmosphere. I think you really nailed it in your analysis. People are terrified and so some fierce creativity got channeled into art, music, crafts, signs, costumes, dance, etc. The fact that 400,000 plus marched and demonstrated peacefully is a huge, powerful statement in and of itself, no matter how folks chose to express themselves. Love your account. Love that you were there. Love the terror/hope juxtaposition.